Nick and I decided that it is high time for us to start going to church on a regular basis. Because, well, only a sucker would pass up wine, crackers and free babysitting while they can zone out for an hour and a half. As part of our church's 100 year anniversary celebration, there was a progressive dinner on Saturday night. The invitation encouraged guests to "dress up in clothing from their favorite decade." Pay close attention to that last part. It's key to the story later. 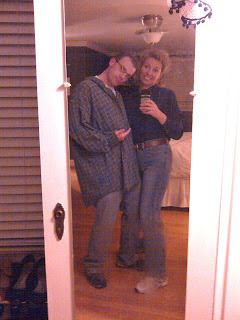 Anyhoo, for obvious reasons, Nick and I chose the '90s. Because they were awesome. And easiest to find costume material. 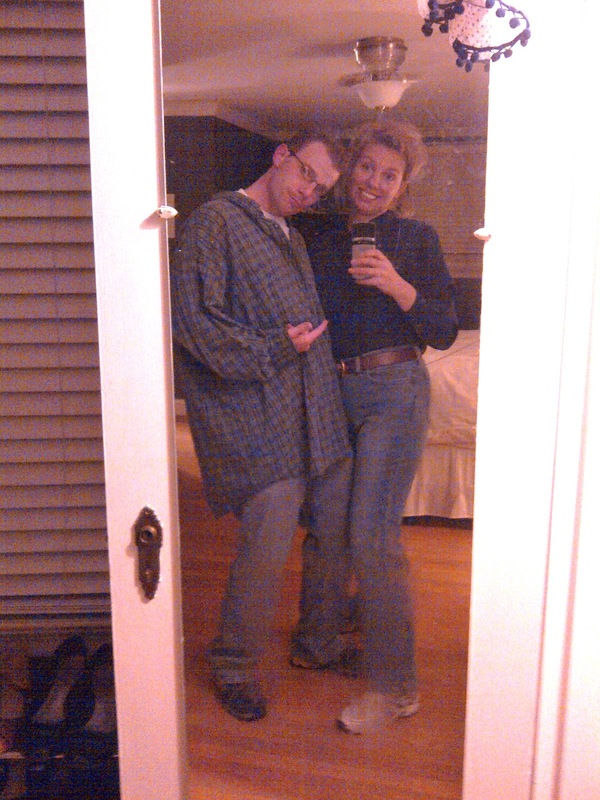 We spent the better part of Saturday afternoon combing thrift stores for the perfect shoulder padded silk shirt and Mom jeans. Once we found it we moved on to searching for my costume. "How do you know when you've put on enough hair spray?" Nick asked later as my hair fused to the sizzling curling iron. "Once your forehead makes a sound like crinkling paper when you wrinkle it you know you're off to a good start." I'm pretty sure I'm personally responsible for destroying at least part of the ozone layer. To this day there's a spot in mid-Missouri where, if you stand in just the right spot on a clear night, you can see straight up into God's bathroom. Classical music floated down the hallway and greeted us as we opened the heavy church door. As we walked toward the fellowship hall, the music and conversation became louder, and my excitement grew as I thought about how awesome our costumes were. I patted my bangs and gave them an extra spray. My first clue something was wrong was the look on the cleaning lady's face as we passed her in the hallway. It was the same look that my kids give me when I step out of the shower. We rounded the corner and my jaw dropped as we stood in the doorway of the fellowship hall. Before me stood a sea of dinner jackets and nice dresses. And gray hair. Probably a hundred people - OLD people - there and not one dressed up. NOT ONE. It looked like we were crashing Betty White's wedding reception. I made eye contact with the pianist and it felt like the notes coming from the piano were choking me as Nick and I both stood there, staring silently at the room full of well dressed, well groomed, old people. He slowly leaned over to me, and, barely moving his lips to as not to attract attention, whispered one word. We slowly, !EVER SO SLOWLY!, took a few steps backward and then turned and sprinted away, past the confused cleaning lady, down the stairs, to a back door in the basement. "NO!" Screamed Nick, rearing back to kick it down. "We have to go back upstairs," I said. The longer we waited the worse it was going to get. Like a band aid. Just get out quick. Don't make eye contact. If anyone sees us we just pretend like we're deaf. And blind. And then punch them in the throat. We ran up the stairs two at a time, again past the cleaning lady, out the door, past three people all looking like they were in an ad for Coldwater Creek, to the safety of Nick's car. It was difficult to run due to the wind resistance against my bangs. But I looked to the east and created a sail, allowing the jet stream to do the work for me. We just sat in silence for a moment and caught our breath. "You think anyone saw us?" I said. "I don't care," He said, starting the car and peeling away. "We have to make a promise to each other here and now. We will never, NEVER go to one of these things unless we know at least five other people who are going." "Promise," I said. "Now let's go hit the town. I don't want to waste this hair."